But just when I was ready to throw in the towel, we arrived at the shelf of pashminas. 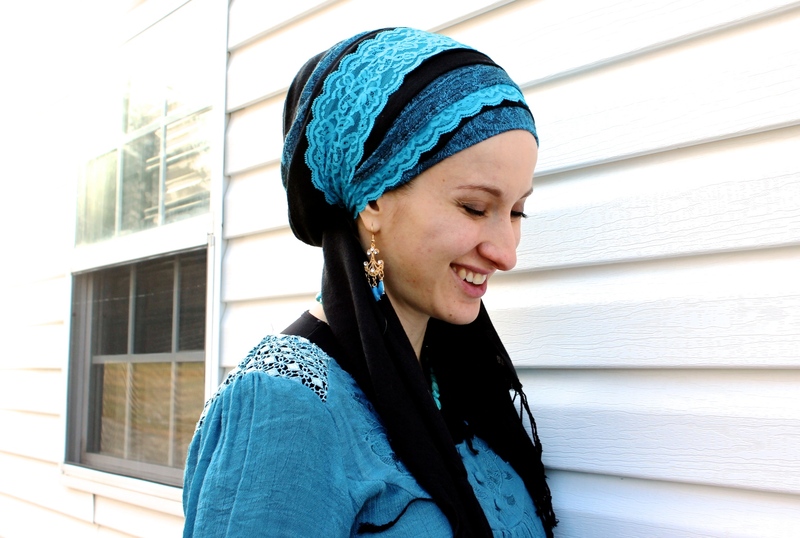 There were not many patterns to choose from and the color selection was extremely limited, yet I was immediately drawn to these luxurious scarves and knew that I would need at least one in my budding tichel collection! They felt substantial, warm, soft against my skin and because I had been growing out a freshly-shaved head, knew that the additional bulk would help conceal the fact that I had no volume underneath the scarf of my own. 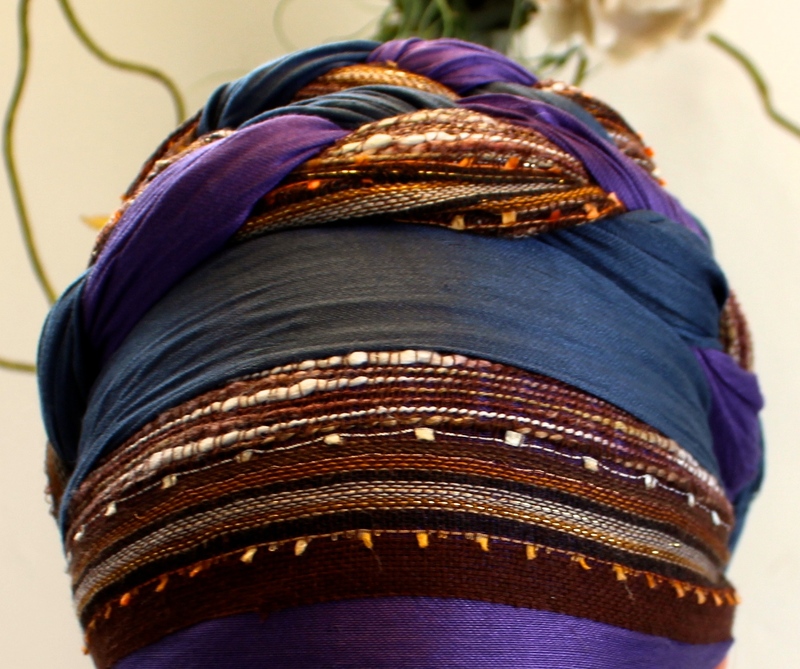 In the end, I had no clue which color to choose and it was Zahari that picked out a purple paisley-patterned pashmina, which marked the beginning of not only my love affair with pashminas, but with the mitzvah of head covering, as well! Many Wrapunzelistas share my fondness of pashminas and this week’s Challenge of the Week submissions truly highlight that fact! We saw pashminas with tails and pashminas tied in turbans. Once scarf challenges, and elaborate layered styles. What we’re left with is a collage that illustrates both the diversity of what you can do with these headscarf staples and the Wrapunzel community itself! Looking for the reveal of this week’s theme and instructions for how to participate? Please scroll down to the bottom of this post! For this week’s challenge, we’ve decided to start at the beginning. For some, the beginning might be yesterday and for others, the beginning might be last year! My beginning was with that pashmina my husband picked out… Let’s go way, way back, ladies! Would you like to be featured in next week’s collage? Head on over to the Wrapunzel Fangroup and share your pictures using the hashtag #myfirstwrapunzel. If you would also like them featured on next week’s blog post, make sure to also post them in the comments on the pinned post at the top of the Fangroup page, so we know to share them. We can accept up to 2 headshot-style photos per person – no collages, please! If you’re not on Facebook, you can also email your pictures to us at wrapunzelthestore@gmail.com with the subject line “Challenge of the Week.” Can’t wait to see what you create!! Hello lovelies!! It’s a cold and sunny day here in Baltimore, and it’s the perfect weather for a double pashmina wrap! Enter the Shira Tails! This has been a well circulated wrap tutorial, but sometimes ladies have a little trouble looking at it because we took it randomly when meeting Shira at one of our shows! So here is my layered version! And just because I felt like it, I decided to experiment with adding our new Celtic Braid headband… WOA! It just took this tichel from cozy fancy to wedding worthy! I only wore it long enough to snap these photos, because it was just a little too fancy for teaching music to kidlets, but I know I’ll be wearing it again soon when the occasion arrives! Tutorial: Olive Grove aka Layered Waterfall Twist! As requested by many of you, but specifically for one special woman – you know who you are! This is such a versatile tie using the “Waterfall Twist” technique! Make sure you are comfortable with the original technique before trying this one! Keep in mind as well that depending on how you tie the knot, you will either end up with the fringe father forward or farther back. Both work! Check out the photos to see the different ways this technique can work out – it can go super fancy! For the original look, you will need a shimmery and 2 in 1 in the same colours. Also experiment with where you tie the knot – it changes the whole look! Higher up on the crown of your head give a more “crown-like” look (ie the navy in the tutorial). 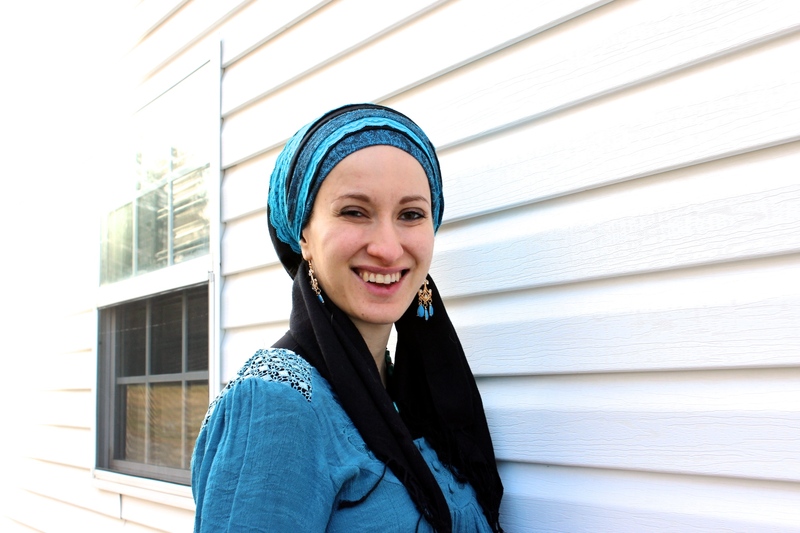 Chaya Lester, the Poetry Slam ‘Kabbalist Feminist’ is a Lady Wrap Star! A beautiful photo of Chaya being awesome, before we met! You may recognize Chaya from this video, which has spread around the hair covering world like wild fire! Before I came to Jerusalem, Rivka Malka contacted her and we all agreed that we had to meet and connect, as well as get Chaya Wrapunzeled! Little did I know, that the Shalev Center, where Chaya lives, is less than a two minute walk from where we’re staying! We started off with some Wrapunzel makeovers, both with my wrapping Chaya, and her wrapping herself while asking questions! We figured that would be super helpful to everyone here… like having a coach in your own room! We ended off with an interview, and I must say, if you watch one video out of all of these, watch this one! But really, watch them all – she is so awesome and I’m super happy that you get to meet her! And then Chaya wanted to try doing it herself! Awesome! And now… the quick and easy Waterfall twist! 3 minute video, and it shows both my doing it on her and her doing it herself! Win! Finally, here we are doing an interview. Seriously deep insights into hair covering and what it means to be a female! She is just so cool – I hope you’ll learn as much from this as I did! How grateful am I, to not only be in Jerusalem, but to also be here at the same time as my sister in law, Naomi. Many of you will recognize her as a Lady Wrap Star on here, and she is so humbled that her post has touched so many women! There is much that I want to say about sisterhood and friendship; and though we both didn’t grow up with sisters (I have one brother, she didn’t have siblings), we are learning together. We are learning that there is infinite power and potential in woman to woman connection, and I know that loving and bringing out the best of each other is going to change the world! And now… tichels 🙂 Yes, we traded sari scarves! And here’s a closeup of my wrap! Peacock pin was a long time ago gift from Naomi, and sunny shiny yellow scarf is from my mother in law. Yay for beautiful gifts and feeling your head being hugged by the ones you love! Let’s all take a moment to be grateful for the incredible women (and of course, men too – let’s not forget them!) that we have been given, and think of one nice thing that you can tell one of these people today. Now, go do it 🙂 With love.